Marriage is a sign of Allah. His favor, kindness, and mercy are manifest through it. It is also a means to please Allah through the application and embodiment of the way of the Messenger of Allah, Allah bless him and give him peace. A marriage imbued with the spirit of Islam is a perpetual act of worship. Shaykh Faraz Rabbani and Ustadha Shireen Ahmed discuss how to make marriage transcend the daily routine into an act of devotion one uses to journey to the Afterlife seeking Allah. Allah created spouses for us as a means of emotional fulfillment. He places between the couple deep, loving concern, and a bond of love which is shown through acts of kindness. However, this can be elevated beyond physical and emotional interactions and turned into an act of worship that refines the soul too. 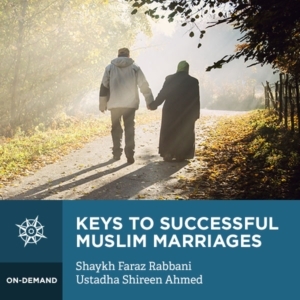 Shaykh Faraz Rabbani and Ustadha Shireen Ahmed explain in this course how one can make marriage the locus where the higher moral teachings of Islam are manifested. Amongst the matters discussed are the purpose of marriage; what to look for in a potential spouse; the Qurʾanic bond; how to manifest good character to each other, and much more. This course clearly lays out practical steps to embody the spirit of the teachings of the Messenger of Allah, Allah bless him and give him peace, in looking for a spouse, getting married, and engaging with each other in a manner which is most pleasing to Allah. The focus is to transform the everyday interaction a couple has into a marriage that is a manifestation of one of Allah’s signs – a marriage that is for Allah. Umm Umar was born and raised in Canada. After graduation, she set out to formally pursue sacred knowledge, studying Arabic at the University of Damascus and Islamic studies at Jamia Abi Nour and taking private classes in Qur’anic recitation, Prophetic traditions, Islamic Law (Hanafi) and the Prophetic biography. After ten years abroad she returned to Toronto, Canada, where she resides with her husband and four children. She currently works in the Academy Department of SeekersHub Global, bringing years of insight to facilitate meaningful Islamic learning online.